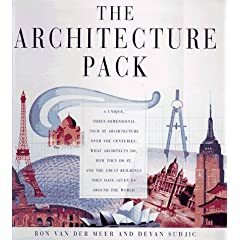 A work of art in itself, The Architecture Pack is a highly sophisticated version of the beloved pop-up book that offers a unique, cross-cultural, three-dimensional tour of architecture through the centuries. By flipping the elaborately engineered pages, we learn what architects do, how they do it, and all about the great buildings of the world from antiquity to the present. It's packed with information and hands-on activities, models, fold-outs, pop-ups, and 3-D glasses; readers can even fold out a miniature version of the Colosseum in Rome or a French Gothic cathedral. There are discussions on the development of the dome, new materials and shapes, sculptural buildings such as those of Gaudi and Le Corbusier, and skyscrapers. Also included in the pack are a model (with assembly instructions) of Gerrit Rietveld's famous, flat-roofed Schroeder House; a glossary of architectural terms; a fold-out time line of the history of architecture and architects that runs from 2670 B.C. to A.D. 1997; and a cassette tape. This wonderfully accessible introduction to architecture is sure to generate enthusiasm from both children and adults, simply because people can have fun with it.